Kenny posted about it and explained it today. I'll steal his wording cause I'm lazy.
" This signal is rare and indicates a rather large move ahead. 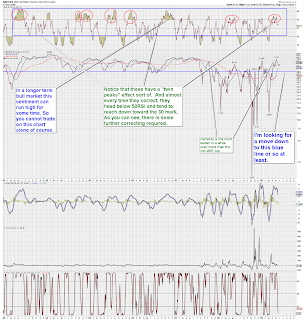 The Breadth Thrust Indicator is another momentum indicator. Developed by Martin Zweig, you calculate it by dividing the quantity of advancing issues by the quantity of advancing plus declining issues, and creating a 10 day moving average of the resulting percentage. 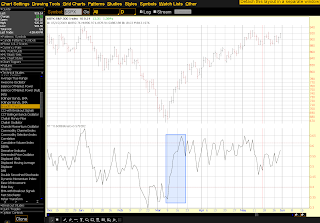 Having calculated it, you use it if, during any 10 day period, the indicator rises from below 40% to above 61.5%. This is supposed to indicate that the market has moved from an oversold condition to one of strength (but is still not overbought). It fires rarely (the inventor says only 14 times in the last 50 years), and often seems to herald the start of a new bull market. As it fires so rarely, it is not much use when day trading the markets, but if you DO want to use it, take a 10 day moving average of (Advancing Issues) / (Advancing + Declining Issues). 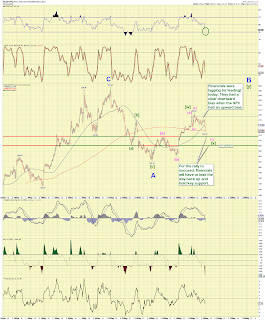 You can find this indicator with ready made 40 and 61.5 lines on Think or Swim's Java chart platform." Apparently the last time it fired was in 1984 and then early this March. Here is the indicator which is available as a technical study under TOS. I hadn't known about this until Johnny Blue told me about it in comments. The funny thing is the indicator didn't "officially" fire until the 17th of March (maybe the 18th). On the 12th of March I had emailed Kenny back and forth about six times as we discussed that there was a good chance Primary wave 1 had ended at 666. The 12th of March was the day the rally was in its 4th day and it had just breached 750 for the first time as it was coming out of the sub 700 zone. However breadth and volume was easily seen on the indexes and I believe the 12th was the second 90% up day which usually marks a trend change. That night Kenny declared P1 over and P2 upon us. 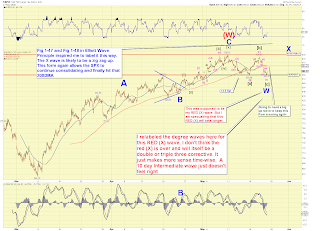 I was willing to follow Elliott Wave International's count for awhile as they still hadn't given up hope of a 5 of (5). My "uncle" spot was about the 780 mark as I had been calling for a rally to 775 possibly. So 775 came and all was well. Ironically that was on the 17th right at the spot where the Breadth Indicator was just beginning to cross the 61.5 line. On the 18th the SPX pushed up to 800 and that night I of course jumped on the P2 bandwagon officially. So Kenny confirmed P2 4 days into the rally on the 12th of March when the market just breached 750 5 days prior to the Zweig indicator firing. In retrospect I should have too. I expressed reservations about a (4) of 5 from the 12th to the 17th. I allowed my 780 max retrace target to be hit. And then my second mistake was assuming a 38% correction would come during this P2 rally. It never did. P2 seems to be on a singular mission and it has a sense of urgency about it. It may still correct 38% but that would probably have to start this week. I don't get hung up about it anymore. Also the 200DMA. It will hit it that much is obvious. I no longer assume anything. P2 could trace to 1100 (50% retrace) for all I know. After all, its hard to gauge when social mood is ready to let it all go again on the next correction downward. Its not often I throw submicrowaves up on a chart. But Friday's end of day move was so curious I couldn't help myself. Hey thats what I do! I charted the end of day structure as best I could with what the waves say so far. And the waves point toward a blowoff wave 5 top. The e-minis match up well with this also. A gravestone-ish type doji candlestick even showed up on the hourly due to the way trading stops on Friday. The e-minis actually had almost a 10 point move in 1 minute and came back down in the same minute. I found another prominent instance of end of month spurt at the finish (its not that uncommon). It also happened on the last day of November 2002 on a Friday. The curious thing about that chart is it opened the following Monday a point higher and then collapsed back down with the first hour of trading. So this supports Kenny's take that the market may open and hit his 921-922 target and then head down. So how futures of course move Sunday will be some strong clues. Monday's opening will also be key. 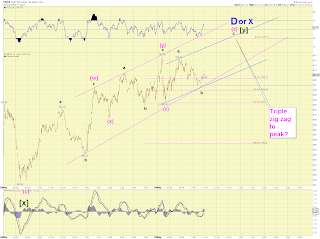 First, let me say that I think the market likely hit either a "D" or "X" wave peak today. In either case, we are looking at a 5-3-5 zig zag down. How bearish and big the zig zag only the market can determine. Lets just say that 880 holds and perhaps we get an E wave early next week and the triangle pattern stays true (good chance it will). What does this triangle Intermediate (X) wave mean? I quote Elliott Wave Principle pg 51: "A triangle always occurs in a position prior to the final actionary wave in the pattern of one larger degree, i.e., as a..............or the final X in a double or triple zig zag combination." 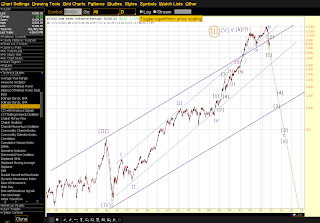 So if the Intermediate sized (X) wave triangle is indeed the corrective (X) wave pattern, it means the market will likely see another Intermediate-sized (red) 5-3-5 zig zag UP to 1000 take place (as expected). AND this next ABC zig zag will be the FINAL zig zag up pattern in Primary wave 2. That is per Elliott Wave theory rules on triangles. So I have developed a chart based on this theme. The upper target is just above the 38% retrace spot. About 1041 SPX. Time? Sometime this summer. I must say charting this P2 I had assumed it would experience a 38% setback along the way but it has not. There seems to be a "sense of urgency" with P2 as if it knows it only has a small window in time in which to retrace to 1000 and just above before social mood decides its had enough and throws in the towel again. 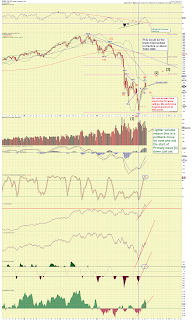 Afterall, EWI posted a chart recently showing the SP 500 already trading at a trailing four quarter P/E of 60! Now I don't much pay attention to P/E's and don't use them, however as EWI says, any indicator, even if a lagging one, that shows extreme moves, its worth noting. P1 took about 17 months to complete. If P2 took 4+ months than your looking at a Fibonacci time of about a 25% ratio which would be acceptable. This Intermediate sized triangle is important. Because if it stays a triangle and a breakout comes, it means the next ABC Minor sized pattern will point the way to the top. Primary Count is the Blue Minor X wave peaked today and on Monday the next Minor-degree level corrective wave will begin to play out. I posted a lot last night on these patterns. The alternate of course is the giant Intermediate sized Red (X) wave triangle. Today's high would have been the "D" peak. I also posted a lot on that scenario too. In both counts, the next short term moves would be the same: Down. And the wave patterns down could very well take the same form in both patterns: zig zags. So the Blue X wave scenario supports some big red distribution type days and maybe the market is due for some and the first day of a new month - June - would be a nice spot I suppose to supply that down day. Is there a straight up bullish option come Monday? Sure. That would mean that the E spot was hit yesterday and the market will break out and up come next week. But the technicals and wave structures so far from yesterday do not really support that scenario so that is a low probability at this stage. 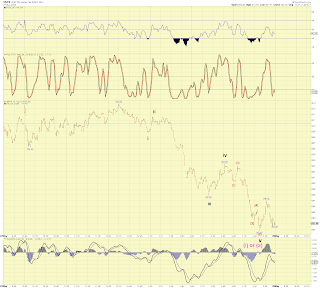 Also I see negative divergences setting up on indicators and such. In addition that would mean that Intermediate RED (X) wave would have taken the form of a triangle. I really don't know of any examples of X waves at ANY degree to be solely triangles. I'll post more this weekend for sure. The triple zig zag is out. A possible intraday triangle may be developing and a breakout pushes the high to 919 or so. Adjusting on the fly. Anyways, the intraday waves since the early peaks looks like triangle waves - complex and overlapping. EDIT 11:30 AM: Updated the chart. I was just saying last night I never charted a triple corrective but if there was anywhere where it would happen is in this big triangle/X wave or whatever the hell you want to call it mess. My chart would show a triple zig zag at Minuette degree from yesterday's low. A triple correction up would be required because maybe the market needs to take out that recent 913.84 high and the initial move up this morning failed by a point. Its all a sloppy mess. I dunno, I'm bored so don't get on me too much hehe. I'm off today, and by chance I am sick as a dog and huddled with hot chocolate surfin' around. 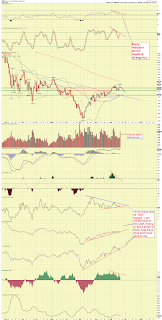 These 2 charts show my previous post in the bigger picture. The fun in EW charting is that if your truly understand the theory, yes you can chart microsquiggles and the more you do it, the better you become. The hardest part I think is corrective waves, particularly when double correctives start stacking up at numerous degrees. Why are there double (or triple) correctives ? Its simple. When the market performs a corrective pattern, if that pattern is not "sufficient" in either a) time b) price (or both) then the market will trace another corrective pattern. The "connecting" or combining wave between the two correctives patterns is known as the "X" wave. And it also is a corrective pattern, usually a zig zag. So actually you can say a combination consists of 3 patterns but the proper way to approach it is to call it 2 patterns with a connecting X, or a simply a combination . The term "double three" is also used and this implies a general sideways movement. The better term to use is "combination". We then label the first corrective pattern in the "double three" or "combination" as a W. The last corrective pattern is labeled Y. If there is a third corrective pattern it will be labeled "Z" with a second X wave in between the second and third patterns. Triple combinations are rare at any degree. I don't think I ever charted a bonafide triple three at any degree. My one chart here shows numerous double corrective patterns (mostly double zig zags) at several different degrees. Its an excellent example of how confusing it can all be unless a light bulb just went on in your head like it did me over time. However it is proper EW theory application. Simple? Once you learn the "rules" and guidelines, its not too hard. But yes it takes practice and I have been counting most every squiggle for about 8-9 months running. Let me explain it another way: Primary wave 2 is a corrective wave pattern, or an ABC "three". 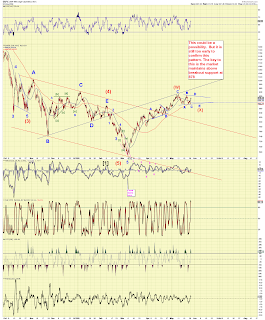 If the market decides P2 needs to trace from 666 to 1000 it will try and perform that in a giant 5-3-5 zig zag. But it already traced a zig zag and it left it short of the mark. I call this wave Intermediate (W) So apparently it isn't done and now there needs to be an (X) wave corrective pattern and then a (Y) wave pattern to peak. This Intermediate Red (X) wave will itself, consist of a valid ABC pattern or a "three". But suppose the market traced a 3-3-5 flat (it did) but there wasn't enough time (or price or both) spent in corrective mode so it needs to perform a double corrective. The connecting wave will be known as Minor Blue X. 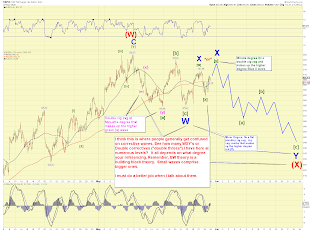 After the X wave, the last corrective pattern plays out. Now lets suppose that inside that Minor Blue X, the market needed to trace higher than 915 and perform more "time" in corrective mode. It fell short of 915 and the time was insufficient so it also was a double corrective with its own Minute degree green [x] wave. See how that works? Depending on what degree your referencing, it can be tricky. Whats even trickier is when I change the degree labels every other night trying to "tune in" the proper degree labeling. It can be maddening yes. You don't know which X your in at any one time hehe. I have to get better with that I agree. I hope this post helps a bit on double correctives. 1.) Bullish triangle that is taking weeks to develop. How the waves move from peak to peak can be maddening if your looking at squiggles but if you step back and look at the forest its fairly straightforward ABCDE in a typical triangle fashion. The key is that 879.61 is NOT breached on any subsequent move lower. Once the E spot has been found, a hard thrust up will take the markets higher above the 200DMA in another corrective wave of Intermediate size. 2. ) A 3-3-5 flat developed from the 930 SPX peak the end of which is marked with a Minor blue W wave which would be the first corrective pattern of a double corrective pattern, also known as a "double three". A subsequent "X" wave (zig zag or double zig zag) is playing out. Once the X wave plays out the next corrective pattern in the WXY "double three" would most likely be a big 5-3-5 zig zag down that breaks through 878 support. So that's what it basically comes down to. In one case 879 holds firm. In the other 879 breaks in some fashion lower. The break lower may not even be that much however I would think an eventual move to 830-850 (or the 38% fib retrace spot) would not be unexpected if 878 breaks. However we'll see. 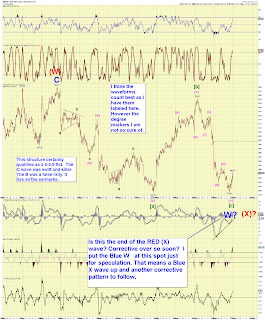 The chart I posted shows the D wave or X wave, whichever one it may be. Short term moves they both imply basically the same thing. Most can understand the D wave in a triangle. For those that have the Elliott Wave Principle, see Figure 1-48 for the theme of the WXY wave that I am proposing. For those that don't have the book, it shows a 3-3-5 flat for wave W, followed by a zig zag X wave, followed by a final Y wave zig zag that ends lower than W.
The W and X waves gives the *appearance* of a triangle but ultimately is not. Its a false pattern. I am not saying this is a false pattern here because frankly the market decided on numerous occasions that 878 -880 is important support so who is to argue that until proven otherwise? Other variations on the 2 themes above is that the X or D wave actually ended at 913.84 on Wednesday's peak or the E spot was actually hit today and the market is fixing to get real bullish. 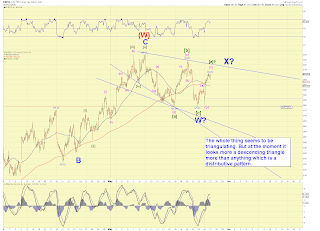 I think the E wave hit was a false bounce for now and tomorrow should prove that out. And ideal D or X wave spot would be the space between 913.84 and 924.6. In either case, the market will be heading back down toward support under 900 again. How bearish the move is will determine if it was a D wave or X wave peak and if 880 will hold one final time or not. And that I can only guess. The market looks poised to move higher tomorrow. There was a rising wedge today but it did not collapse so it seems like a red herring. Overseas markets may be a bit bullish especially Europe and it might reflect in the futures tomorrow. I'd like to talk about triangles as I feel it is very important at this stage of the game and I'll try and keep my thoughts organized. As I have been showing lately, both the E-minis and SPX have been charting triangle-type moves, zig zags up and down, which is the way its supposed to be for triangles. I must say this right now: I ALWAYS respect (well except I haven't particularly respected this one) triangles, especially ones that develop over a period of 3 or more weeks until they prove otherwise. And I must say, my call for an X wave (and hence a false triangle) is a spit in the eye of this long-developing triangle. 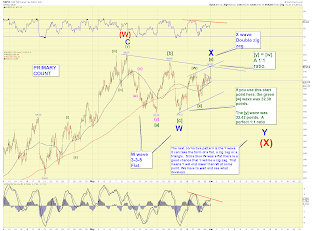 Another aspect of triangles is that either the C wave or D wave in the cash index is usually a complex structure. 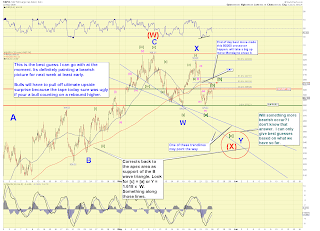 The "C" was certainly simple on the cash index, basically a 5 wave impulse move. Had I marked yesterday's 913 high as the D wave top, that too would be a simple looking wave, relatively speaking. So what am I saying? I am saying a move Friday higher to 921 or so would satisfy a complex D wave pattern (double zig zag of some sort). Ideally this wave should stay below the B wave peak of 924.6 although in an ascending triangle pattern it would be allowed to squiggle a bit higher say by a few points or so. And that brings us to the E wave. Today *appeared* to be a bounce off of the E spot as the market hit a steep trendline. It bounced as if this was the E spot. If it was a true E marker bounce than its simple: The market will break above 924 tomorrow for good and rally above the 200DMA in the coming week. HOWEVER I have reason to believe its was a FALSE E wave marker. 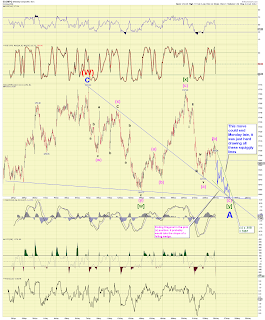 The setup looks too steep, both the C and D waves look too simplish on the cash index at the moment, and market internals give clues that we are still trapped in a big triangle. There is an excellent chance the true D wave peak comes tomorrow at roughly 921. So here would be the setup: Market gets bullish early tomorrow and hits say, 921, forms the D wave peak and dribbles lower. Monday is down hard. This would be your E wave playing out. 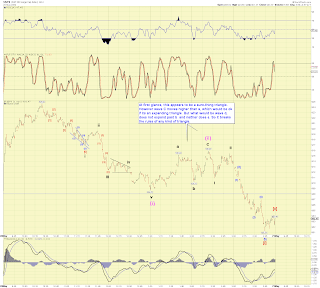 Bearish E waves of Minor size should be typically accompanied with BAD news such as GM going bankrupt. The psychology of an E wave is such that everyone thinks its the true NEW market direction (in this case down) and bears pile in but then a massive bounce at the TRUE E spot at the end of the triangle and the market breaks higher for good. There is one last thing to talk about with triangles. They are always the LAST corrective pattern in any combination or such. That means if it does turn out to be a true bullish Intermediate wave-sized triangle that took 3 plus weeks to trace out, that means the market is moving higher on another bullish ABC move higher, above the 200DMA and likely on an attempt to breakout above 950 and head to 1000 SPX. There is no such thing as a double corrective pattern with a triangle pattern as the FIRST pattern. It's against the rules. So to review: We have a triangle of some duration going on (3 weeks) and that MUST be respected until it proves otherwise. The other potential that I have given mostly as my primary is that the market could be in a 3-3-5 flat and then an X wave (in this case a double zig zag X wave) and that the combination of the two creates a "false" triangle. The false triangle setup would breakdown under 878 as a hard Y wave played downward. However I cannot sell you that as gospel. The true triangle setup has 879 holding support yet again next week and a breakout move higher finally comes and the market rallies on its next ABC move to a much higher spot above the 200DMA. I always respect triangles and I need to start respecting this one some more. Keep playing the bounces in between or hold steady....but by next Tuesday this thing may be finished one way or another. 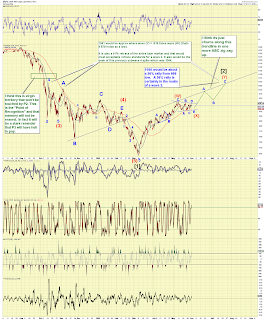 Once a breakout occurs (up or down) it will get easier with the bigger macro picture. The market crossed 900, up and down on 10 separate, distinct occasions in the past month. EDIT 2:20 PM. Actually the X wave could go and hit the 200DMA at around 928 - 934 tomorrow and then fail miserably. 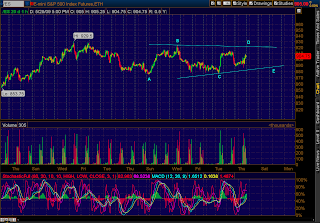 A true bullish contracting triangle should thrust up and out and be a breakout move higher on some good volume. I think its a false pattern for now. Market internals are not that great, only a 3.1 advance/decline volume ratio in the move back over 900. At 908.5 [y] would equal .618 x [w] At 921.83, [y] = [w]. Anything more than 921, and yes this may be the breakout move higher indeed. Been a real whippy day. Its judgement day for the markets. Maybe tomorrow too heh. Then a new month come Monday. 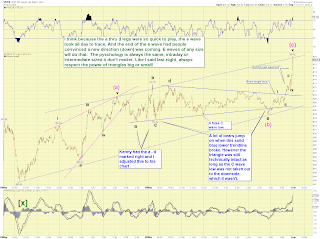 There appeared to be yet again a clear 5 wave impulse move down yesterday. And once again that is a good EW "marker" for us to propose some possible patterns to play off of that. I have charted one such pattern on the 5 minute chart. Its a 3-3-5 X wave scenario. X waves are usually zig zags which means that yesterday's 913 peak *might* have been the X wave peak. That would mean the intraday 5 wave move down yesterday is part of some larger 5 wave move and perhaps a very large 5-3-5 zig zag down that crashes through 878 support. That could still very well be the case. However the larger pattern appears to be a "bullish" triangle and if the bulls buy the 880 spot one more time that very spot is going to appear to be the "E" wave spot. 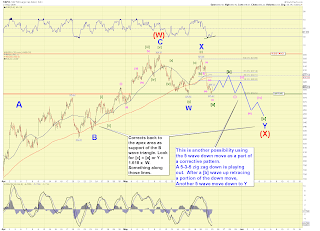 So I propose that perhaps this FALSE E wave bounce will result in one last rise in the form of an X wave 3-3-5 flat. It hits resistance one last time on weak market internals and then reverses hard for good and eventually crashes through 878 support on the Blue Y leg down. One last note: Notice how the legs down in the recent market action are CLEAR 5 wave impulse patterns down much more so than on the upside moves which are more confused looking. Maybe thats a clue also in that the market really wants lower prices under 878 support, at least for a while. You know I don't think much of Economists. They can tell you what the supply/demand of a piece of corn is at a moment perhaps, but they do ZERO for predicting social mood. And social mood (sentiment) is the driving force of economies. Its pretty much that simple. Elliott Waves attempts to track these recognizable sentiment swings in social mood that seems to be ingrained into our very genetic fabric. The stock market is the "gauge" or indicator. The fact that this story comes out near the top of the first major leg of P2, is only fitting. A corrective in social mood and prices and then another bullish ABC advance of some sort will only cement feelings of bullishness and hope. The market is not there yet. At 1000 SPX, they will say even better things about the outlook of the economy. At the top of P2, a plurality will likely determine the bottom was definitely in March of 2009 and that its "all clear". OK so what "sparks" P3? Well, it could be anything. Once P2's mood tops, perhaps there will be a singular event that easily "explains" a subsequent p3 wave. And many will believe it. Perhaps a war of some sort or some "incident". It won't really matter. I re-read this story and I find NOTHING on WHY the economy will start to stabilize. Its full of hope yes, but the story provides nothing in facts other than that they did a survey of some guys and they were in an upswing mood so they gave a decent, (yet hedged of course) economic outlook. Incidentally economists TRACK sentiment such as consumer sentiment yet they do not make the leap of Elliott Wave Theory behind it all. They track sentiment and surveys of all kinds! But again, they never make that solid connection....hence they are merely subservient to the sentiment that they track! When everyone is feeling good, THEY feel good, and make rosier predictions. Look it up. Look up all the "predictions" for 2008 and almost NONE got it right. Some were so way off base you wonder why they still can keep the "job" of being an economist. Sure the economic numbers will give "pause" and some will suggest things are getting better but that is to be expected! "Numbers" do not go down in a straight line either! Personally I think P3 shows the path to a dire outlook in social mood. Enjoy P2 while it lasts. Many did not believe in the theory of Elliott Waves yet we predicted P2 was coming and that there would be a nice rally wave and that "good tidings" will come. Indeed it has. But eventually when you are at the top, there is nowhere to go but down. Look, Economists cannot go out on a limb. They won't be invited to play in reindeer games if they do. 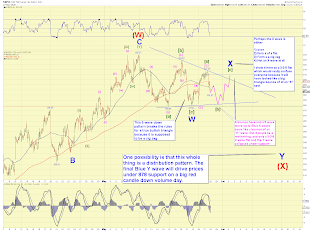 I'll give you a prediction: Primary Wave 3 will cause the market to explode on several instances to the downside. Circuit breakers. And then you'll lose more freedom because government will take a bit more away. Fascism and world wars reigns at the bottom of nasty social mood corrective swing periods. Sometimes this results in a Dark Age when they are at the millennial wave level. Primary Count: SPX is tracing out an X wave flat. The alternate is that the X wave peaked today. Secondary Count: SPX is tracing out a bullish contracting triangle and a move down to "E" will produce a thrust rally up and begin the next ABC Minor moves to a higher mark and finally breakout of the trading range the market has been in. The bouncing between 878 and 920's will soon likely come to an end one way or the other. Either a final bounce off near 878-880 support will produce a breakout move higher above 930 SPX or the bounce will be "false" and turn down on a dime and break thru 878 support lower. To be honest I slightly favor the latter because I don't think bullishness has been shaken out enough just yet according to my $BPSPX chart I provided. In addition, the whole pattern looks "descending" more than anything on the SPX, at least at this moment in time. And that would be a distribution pattern more than anything. 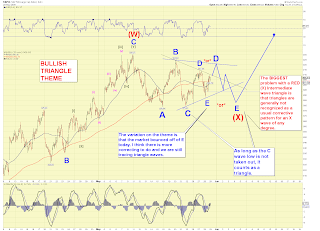 The bullish triangle could be just a big red herring for the bulls. They buy the "E" spot bounce , see a 5 wave move up to X (3-3-5 X wave flat) and then a hard reversal sends the market crashing through 878 support and catches bulls completely with their pants down. In either case, we'll just have to let the market decide if it has corrected enough to support a volume move higher above 930SPX and rally above the 200DMA. 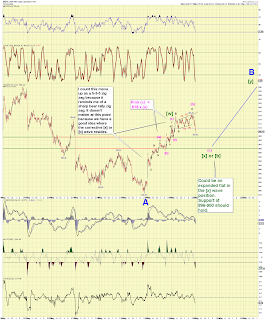 My gut feeling is that it will sport a second corrective pattern (after a blue X wave), maybe a zig zag down to Y. A lot of trading occurred in the e-minis since Friday. If you were to chart the e-minis, all hours, you'd almost have to chart them as I have them above. They show triangle action going on. At least for the time being. The 5 wave move down from 923.5 (924.6 SPX) looks very clear on the cash index but on the emini-s its a 5-3-5 zig zag (5 minute chart) with a classic ending diagonal move (every "three" is in there and no rules are violated). And that would fit a triangle pattern. Also as the C wave, it is rather complicated-looking (at least the last few days of off hours trading) which can be typical for a C wave in a triangle. I cannot say this will play out and be the entire Intermediate (X) wave corrective pattern, but I wouldn't be doing you any justice if I did not show you this pattern. For at the moment, the rules of a triangle can be counted to be there, at least on the e-minis, all hours. As a side note, the NASDAQ made a new low taking out last Thursday's low. The SPX and DOW did not. What does this all mean? It means use all means available to help determine the wave patterns. Well the volume today was less than last Thursday and Wednesday red down days. But still an impressive rally back to 912 nonetheless. 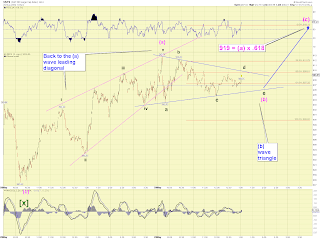 Look for a sideways to down day tomorrow and then heading up to the triangle trendline at "D". and then a move back to E. These should be all zig zags of course from point to point. Upside Surprise indeed. How about I slap up a chart, threw up some degree markers and call it an update? hehe. Rather than post a detailed chart on where they market may or may not go, I'd rather talk about a few details instead. 1) Advance/decline volume was a paltry .26 in the opening moments. Then a hard reversal that broke a ton of short stops and massive short covering. Gap at 900-903 was closed. Market got bogged at 912 resistance or so. The futures were lolly-gagging since Sunday-Tuesday morning and MM's seen a chance to smack it the to the upside. Thus a stampede to higher prices. The whole pattern since the initial rise to 929 seems to be triangulating in some sort of fashion. 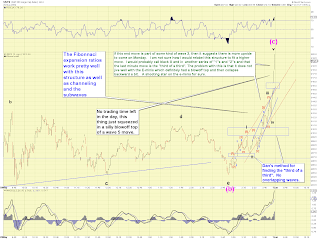 The 60 minute chart shows one potential pattern. Triangle waves or just X waves in general are unpredictable in the short term to a degree. But stepping back and looking at the big picture, the market is consolidating above breakout resistance and holding key support at 878. The 200DMA drops lower and lower. Stuck between the 2 for now. I suppose 878 will break lower only when everyone least expects it. Or it won't break at all. I make no assumptions other than the market will do what it will do. EDIT 11:08 AM Sunday: Changed the references from "Monday" as of course Monday the markets are closed. I'm still groggy heh. The chart still says Monday but I'll be lazy. Thanks Iggy. The move from 924.6 to 879.61 was a "textbook" 5 wave move. In fact EWI said as much in their Friday's update. I charted the first half of this wave on Thursday http://danericselliottwaves.blogspot.com/2009/05/microsquiggles.html correctly predicting that Friday would see the latter of the the wave play out and it did not disappoint. Its one of the better intraday calls I have made lately. What is nice about this 5 wave structure is that it is clear. It gives us Elliott Wavers a "marker" to go by. We can take this 5 wave move and fit it into bigger structures which gives us a better guess on exactly where we are in the overall scheme of things. As I surmised in Friday's update, this 5 wave move down can be a C wave in a 3-3-5 ABC flat from 930 peak. That is the obvious form and it works well with all the indexes. If your a permabear and think this market will just fall apart from here, you can see it as a subwave 1 of a much larger 5 wave structure down. (Perhaps even if it only a wave 1 subwave of a C wave down in an expanded/downward flat). Those two interpretations are probably the biggest considerations amongst all the wavers in the world and it has them going in 2 different directions. I propose a less obvious, yet viable third option as a front half of a 5-3-5 zig zag in this 15 minute chart. Consider this an alternate of this chart I posted Friday http://4.bp.blogspot.com/_TwUS3GyHKsQ/ShXcf1gpGlI/AAAAAAAAAo0/Fumvj3bwlNY/s1600-h/spx301.png The problem with my Friday chart is that it may be too loose with timelines. I put it together assuming (a) = (c) in a 5-3-5 zig zag and since (a) was a sharp drop, (c) would take longer to play out. This chart could happen if [b] or (b) - since I changed the degree labels - moves higher Tuesday and Tuesday is an up day by chance. So I made a new chart based on the same assumption that the 5 wave move was the front end of a 5-3-5 zig zag lower. I also took an assumption that since the (a) wave was a steep drop, perhaps the (c) wave would be only .618 x (a) considering that there was only (so far) a 38% corrective (b) wave. I also, again, changed the degree labels as this is largely a guess at this point. I have an overall "idea" that the market is experiencing an Intermediate sized (X) wave and this should consist of a Minor ABC (blue). So don't be too bothered if I change the wave degree labels back and forth from time to time at the lower levels. I am not doing this at random, I am adjusting the degree as time goes on in this (X) wave. They are logical guesses. Intermediate waves take a while to play out. 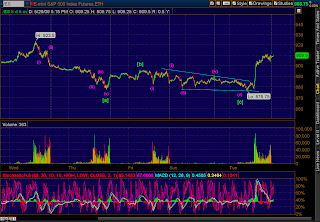 Anyways back to the 15 minute chart and the 5 wave move down from 924.6. If we can assume this is the front half of a larger 5-3-5 zig zag, and we can assume that the market is going lower on Tuesday, then 869 is a possible target. 5-3-5 zig zags often have the length (price change) of (a) = (c) as a common relationship. However if the "(a)" wave is a substantial dropoff, sometimes the (c) wave is only .618 x (a). If we assume that the 896 high on Friday was the top of the (b) in this 5-3-5 zig zag, then .618 x (a) = 869. And you can see this is a support marker also. 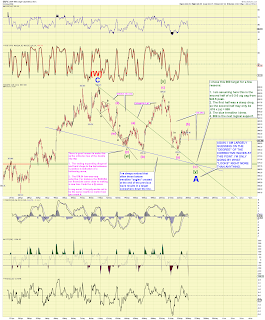 Its just another attempt at nailing down a possible intraday move using wave technology. This pattern nails 869 as Tuesday's low and then a rally, perhaps of decent size late Tuesday carrying through to Wednesday. 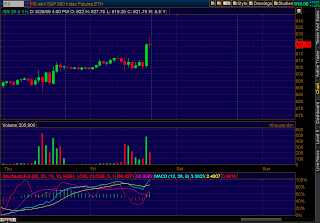 This kind of move would perhaps show positive divergence on at least this 15 minute chart. The thing about these kinds of charts is that it is easy to tell if it is playing out or not which is why I make them and post them. A choppy downward struggle on Tuesday toward this target would be indicative. If it is appears the market is doing something else Tuesday, you can ignore this chart of course. I'm going to start posting the weekly every Friday or on the weekend. I sometimes get asked why I don't show this. I should as I certainly always look at it every week. 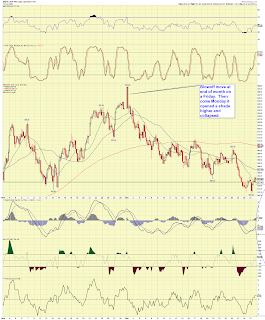 The weekly does indeed, trump all as Erik http://erikmarketview.blogspot.com/ likes to often say. He is right. What stands out a bit on this chart are these items: 1) Gravestone-type doji candlestick pattern which is bearish. 2) Lighter volume on the downside the last 2 weeks from peak which is bullish in the long run. 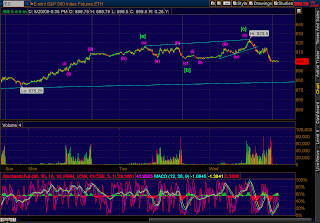 3) RSI trendline just went below 50 which is bearish for next week. 4) For all the people who still email me telling me this is wave 4 in Primary 1 look no further than the RSI or all the lower indicators on this chart. Does any of these appear consistent to be in a P1 still? 5) The "look" of P2 so far appears on the light side. A move down to my (X) and then up to 1000 SPX would be very aesthetically pleasing to the eye for an EW pattern. Sometimes its just that simple. 6) The four lower indicators appear ready to "break" the uptrends in place. That would be a weekly sell signal I suppose. I always assumed a major bearline would get backtested and at least a 38% market correction would occur on any kind of (X) wave corrective. Maybe its the DOW backtest that is the benchmark. This chart here shows the kind of correctives that can occur and fool the bears. This move would likely qualify for some kind of huge 5 wave move lower on the SPX (but not the DOW) and get bears to pile on. But a closer inspection would reveal a triple corrective as I have charted. This chart is not a prediction but I am just trying to show you the potential correctives that could play out a a Minor level and how it can fool the bears. As I shown in a post earlier today, sentiment is *probably* what needs to correct not necessarily too excessively in price (although it certainly may), however both will likely occur to some degree. Once the excessive bullishness is washed out a bit, look for a move higher. This will of course coincide with the end of any corrective moves such as double or triple threes such as I have shown here. There can only be a triple three maximum and then that is it. That is why the triple three ends in a "Z". This is in no way a prediction. Just a sampling of how the market can move. I like the backtest though for the DOW. A backtest can occur after only just the double three (at the "Y"). And perhaps it doesn't require a third corrective. We shall see. Its all speculative at this point. The Bears are in control. Today was more a consolidation day for the bears than a rebound attempt by the bulls. I have an interesting 1 minute chart that kind of explains today's action. The market basically pushed to under resistance at 896 and triangulated all day. Then it tried for the breakout move but was slapped down rather easily at the 38% retrace Fib mark at 896 which is also major resistance now. Even if the bulls manage once last bum rush up the mountain come Monday, I think it is largely doomed to failure. The 60 Minute chart is also starting to falter. The price action can be summed simply: 875-878 support zone has now been backtested twice. The first backtest resulted in a short-lived, yet spirited, rally that failed rather decisively at Big Gap resistance. The second backtest resulted in a bounce of only 38% (so far) of the previous bounce. The next backtest may not survive much of a bounce at all. Once 875 breaks, pessimism may come into the market in sufficient amounts to allow this (X) wave to correct. 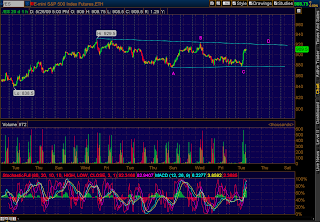 How much it corrects is anyone's guess, but my best guess right now is my count on the 30 minute chart that I show. A huge part of Elliott Waves is tracking sentiment readings. As a member of EWI, they provide good stuff usually in their updates to info that I do not always readily have access to. 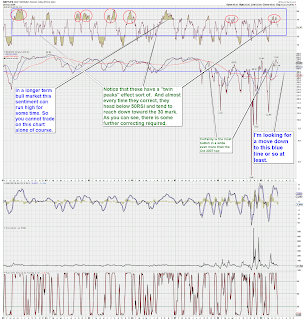 Regardless I do use Stockcharts.com $BPSPX, or bullish percent indicator as one thing I glance at every day. One thing I have noticed is that this indicator likes to form these little double peaks. Another thing I noticed is that once it goes above 70RSI and then eventually corrects downward, the RSI keeps heading below 50 at least , as a minimum. You can look for yourself over the past many years. Currently under 50 hasn't happened yet but seems to be heading that way. So this is one reason why I think this market has further to correct, at least in time, if not in price. This correction does not mean prices will drop substantially, as you saw in April the market moved sideways for three weeks in price yet was considered a running triangle B wave. But usually I think some kind of price correction is required to keep the bearishness heading down. A dip below 875 might do that. But the market could trade sideways in a complicated double three correction for a bit and this could drop appropriately. Then when the double three is over, BAM, another ABC move up of Intermediate size, probably to 1000 SPX. Of course this indicator can bounce around the top for a while, however I think its too late for that as the RSI seems to be headed to that 50 and below marker. Has some potential powerful relationships if the [b] wave traces back up to 896-900 or so which it seems bound to do. Blue Wave Y would be about 1.5 times the length of wave W. Wave [c] would equal wave [a] in the zig zag down and Wave Y would end at about the apex (midpoint) of the previous up blue B wave triangle which would be a very logical place for support to kick in if 875 breaks. So that spot is about 847-851 is the next strong support area in my estimation and indeed it is if you look on the chart. Just thought it was interesting and gave further weight to the potential of this move. Will the bulls squeeeze and close that gap down today? 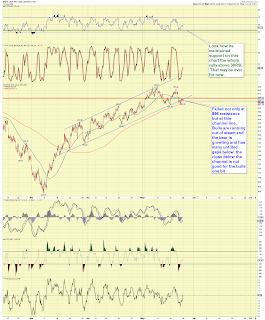 Shorting it at or near the gap seems a very logical short trade. Setting your stop maybe at 908-910 above the 62% retracement point. But this is P2 and upside surprise has the bears guessing still. This chart is more realistic than a bullish ride back to the 920's at this point. In fact I like it better. This aligns better with the technicals I think. So keep an eye on those support resistance levels and how the market interacts. What is clear is the 5 wave down pattern today. That can be linked to a C wave (the flat I showed in my update tonight) or the beginning of a 5-3-5 zig zag move that takes the SPX under 875. Its hard to argue the structure that has developed from the SPX 930 top a few weeks ago. We had a double three corrective down to 878, a sharp zig zag (with a weak C leg) back up to 924 and a beautiful 5 wave move down back to where the B wave started. That qualifies as a 3-3-5 flat pattern. And now there may be a nice bounce from that support. Question is, at what degree of trend? 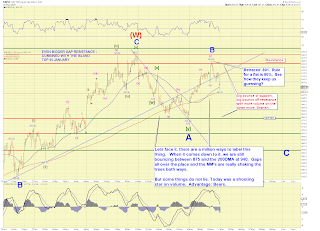 Was today the end of the Red Intermediate (X) wave? 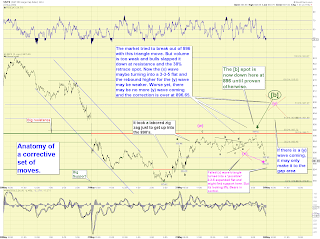 Will now the market get bullish again and rally above 950 toward 1000 possibly? I cannot rule anything out but I still think its lower probability at this point. A topping pattern happened at 930SPX. An apparent corrective "X" wave occurred in the form of a flat back to key breakout support 878 (twice). Question also is: Is the corrective over already? I re-labeled my degree of trends and will speculate that a "double three" (X) wave at Intermediate degree MAY be playing out. The first corrective in the double three ended today in the form of a 3-3-5 flat for Minor wave W. The subsequent "connecting" wave usualy takes the form of a 5-3-5 zig zag and that means an upwards move to Minor X. 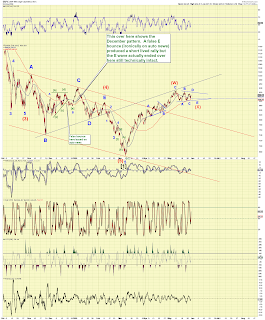 After the Minor X wave peak, the last corrective could be another flat, another zig zag down or a triangle. But that is getting too far ahead of things. For now, I am looking for a correction upward and a bullish one would not surprise me, in fact it would almost be required for this type of corrective pattern. How high can this Minor X wave go up and still be considered an X wave and not some kind of new ABC move higher? Well I would think a return to the 920's or even low 930's is acceptable. There is no hard rule . See Figure 1-45 through 1-48 in Elliott Wave Principle. This was my inspiration. I think he bulls bought the dip once again. I am not the most super TA guy around so my attempts at identifying "sell" signals are not always right. Kenny taught me most of what I know because I study his TA charts with eagerness when he was updating them more frequently. 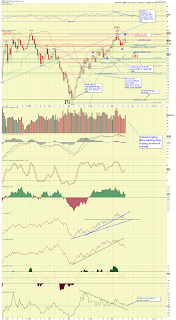 However the DOW has some consistent bearish patterns on all its indicators from the looks of things. It doesn't mean this market is headed to new lows as people keep emailing suggesting that "wave 4" is finally over. I do however see this as a nice spot for an [X] wave pullback. There are several potential support layers for the DOW. I like the 7800 - 8000 area roughly. I mean c'mon, EWI showed a chart where trailing 4 qtr P/E ratios were approaching an all time high of 60! There was good reason I said I counted a valid ABC up pattern from 878 low. 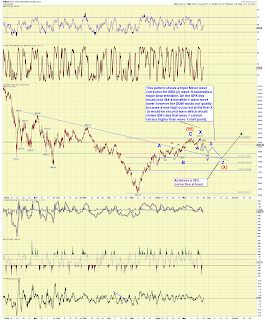 The e-mini pattern, all hours seems to support this notion perhaps a bit better than the cash index. 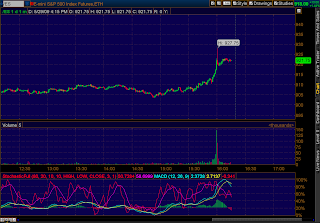 Although this is only a 5 minute chart, you can see the big red down candle volume spikes at end of today. That means taht even more resistance has now set in overhead. As if the huge gap resistance at 922-934 wasn't enough. Now resistance just at 907 (and 915) has also layered itself into the equation. Thats the reason the bears wanted to close it under 905. 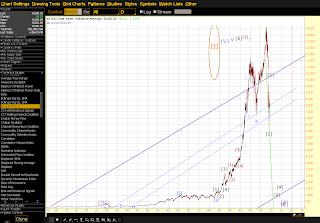 The chart patterns always like to fool us Elliott Wavers as much as possible. Today looked like a surefire ABC zig zag down and that means the market should reverse back up shortly tomorrow. So it might encourage some to buy in A/H's for instance especially when futures hold steady until 8Pm. However I think that zig zag is a false pattern. I charted the microsquiggles for a bearish count, not a bullish reversal. So by my count, the market is again at the point of a "third of a third" potential big gap down and big down day tomorrow. The last time I charted this "third of a third" down potential the market was not quite as primed as it is now for a further fall. It was oversold then and had yet to test the 875 support (an expected bounce area) and was showing positive divergence. But now it is technically ready to hit that big gap down as it is not oversold and peaked less than one trading day ago. So I think the "zig zag" down is a false pattern and is actually just the beginning of a bigger bear wave down. If I am wrong, hey thats just a better short entry! Overseas markets may very well bleed tonight which should pressure the e-minis futures. Europe had like 5 up days. They are primed for a fall too. SPX retraced .891% back from 878 to 930 peak. 90% is the rule. So....I'd call it a minimum requirement for a flat. The DOW was actually 100% retrace and the NASDAQ above 90%. So there is no divergence between the 3. There is an obvious, what appears a clearcut ABC zig zag down from peak today. 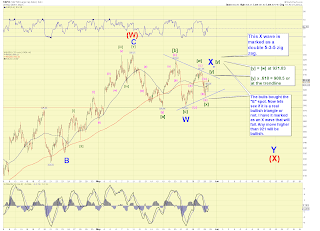 That implies a move back up to finish the B wave at a higher spot. It could happen of course but support at 896-900 must hold. But I think the zig zag is a false pattern likely to be only a part of a bigger down pattern. Maybe I'm wrong, we'll see tomorrow. 5) DOW made a new high today and had big time negative RSI divergence. So I'm trying to keep this simple and not lose sight of the forest. If it heads up again tomorrow, then it will have overrun a big fat shooting star with volume. So be it. Then I'll be wrong. There will no doubt be more bouncing a bit between 875 and wherever. However the bears slapped the market down in good fashion today after a 15:1 open advance/decline volume ratio at 10:15 A.M. they managed to close the market red with a final advance/decline line down to .96....under 1. 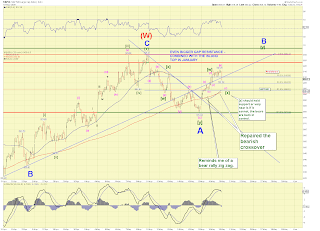 B of [X] (or whatver it turns out to be) wave appears to be over. Bulls must hold support near 900 to get another crack above. One of the personalities of a B wave is that not all sectors participate. So far financials have yet to take out yesterday's early high. It might just be lagging badly, and I suppose if the SPX makes a new price high, the financials will pull up some, however it may be evidence of this as being a B wave. By the way today's early monring rise and subsequent pullback should be wave (a) abd (bi) of [y], or [c], of Minor B of Intermediate [X]. 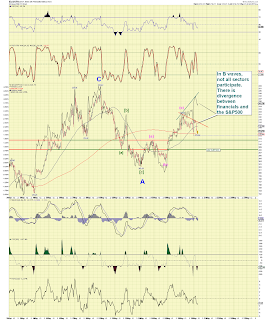 So by my count this B wave rally will make another strong push in a wave (c) (or (iii). 200DMA is the target for a wave target somewhere in the 930's. As in comparison to the market. Financials were on the weak side today after peaking out early. 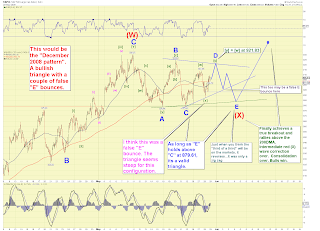 As the rest of the market, they will have to hold key supports if my overall count interpretation is correct. 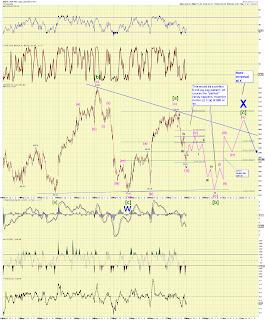 They will need to rally if the market has one more push into the upper gap area. This really is starting to feel like a B wave. I hope the market goes up this week in a last spasm of bullishness. 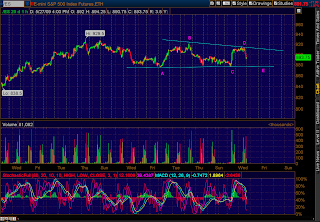 I will short it heavily if it looks like a valid ABC structure from 878 to peak. I already nibbled at QID again at $36.20 (I'll hold -never can say your count is 100% correct) So far, so good. There are lots of ways of counting the moves from 878. The whole structure reminded me of a violent bear rally zig zag that we have seen in portions of this bear market. On the surface, it appears I labeled the waves today kind of funny. But it make more sense as the actual high on the e-minis occurred at 6:30 am this morning so I view today as a "corrective" move. And since the waves are complicated looking, at first I thought them to be a triangle. The key I think, is the market needed to correct, yet maintain 900 support if it is going to have a crack at running higher into the 920's Big gap area. It may have achieved this. Any retrace lower than 896 would be very damaging. 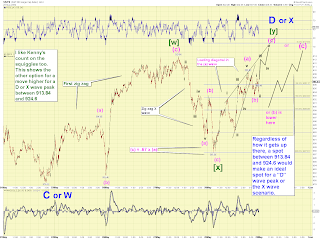 The SPX managed to repair the 50/200 bearish crossover on the 30 minute chart. It re-crossed in a bullish manner. Yesterday's big rally and today's upward corrective bias allowed it to do that. We may have our [b] wave and look for a [c] wave to peak.